*you can add coconut, nuts, cacoa nibs etc. 2. Combine all ingredients, except the nuts in a blender, I used my nutribullet. 3. Once blended and smooth, stir in the crushed nuts. Then pour into a greased 8×8 pan. 4. Cook the brownies for 15-18 and then let it cool for 10 minutes before trying to cut it. Whisk together the white wine vinegar, apple cider vinegar and honey until it is well combined. Stir in olive oil, onion and sesame seeds. Set aside. Add the baby spinach, almonds and cranberries to a festive salad bowl/plate. Drizzle dressing over salad and toss. Serve immediately. 1. Rinse the quinoa under cold water & then boil it for 12 min. Drain and set aside. While it is cooking prep the veggies. 2. For the rolls or bowl– slice the pepper and cucumber into strips. 3. Mix the greek yogurt, wasabi, sushi vinegar, lemon pepper & salt. Then add the cooked quinoa and mix until combined. Taste for salt. 4. Place a thin layer of quinoa on top of the nori, sprinkle some black sesame seeds, then add the trout and veggies. Roll it using the mat. 5. Arrange the sliced avocado on top of the roll. Cover with plastic film. Using the mat press a bit so the avocado sticks to the roll. 6. Remove the plastic wrap and slice it into pieces. You can also skip this step & add the avocado with the veggies so it is inside the roll. 7. To make the bowl. Just serve the seasoned quinoa first, then the veggies and trout. Sprinkle some sesame seeds and thinly sliced nori. Serve with some soy sauce on the side and enjoy! If you have been diagnosed with Diabetes or you are pre-diabetic and you need to make radical changes in your current diet – this low carb breakfast wrap is a filling, veggie-loaded option that promises to hit the spot without spiking your glucose levels. In a small bowl, combine eggs, almond milk and spices. Beat until well combined. Heat the olive oil in a small to medium non-stick pan over medium heat for a 5 to 10 seconds. Evenly pour in the egg mixture. Cook covered over medium heat for 3 to 5 minutes, or until you can easily flip the omelette using a spatula. Flip halfway and cook for another 2 to 3 minutes on the other side. When ready, remove from heat and let cool completely, about 10 minutes. Arrange rocket/watercress leaves on the cooled omelette. Sprinkle the feta cheese on top, then arrange the carrots, red pepper, and zucchini along the middle and sides. Roll the omelette, and then cut in half. Season with salt and pepper. 1. Preheat the oven to 180’C. 2. In a blender add the oatmeal and blend. 3. Then add the bananas, eggs, baking powder and low fat yoghurt and mix until combined. 4. Pour mixture into a bread tin or muffin tin and bake in the oven for 30 minutes. Enjoy for 2-3 days and store it in the freezer. Yes it’s Friday the 13th but this recipe is foolproof! No broken egg yolks here (we hope!). It makes me so happy that we have a whole day dedicated to the humble egg – so versatile, affordable and nutritious. Eggs often get a bad rep for being too high in fat or cholesterol and yes, the egg yolk does contain cholesterol but recent research shows that having 1-2 eggs/day is healthy and in fact, we should be aiming to get in atleast 1 egg/day. Treat yourself to this vibrant and fresh Shakshuka that shows off the egg in all it’s glory! Heat 2 tbsp olive oil in a large cast iron skillet. Add the onions, green peppers, garlic, spices, pinch salt and pepper. Cook, stirring frequently, until the vegetables have softened, about 10 minutes. Add the tomatoes, tinned tomatoes, tomato puree, and honey. Simmer until the tomato mixture begins to reduce, about 10-12 minutes. Taste and adjust the seasoning to your liking. Using a wooden spoon, make 6 “wells,” in the tomato mixture (make sure the indentations are spaced out). Gently crack an egg into each well. Reduce the heat, cover the skillet, and cook on low until the egg whites are set. Uncover and add the fresh parsley and mint. You can add more black pepper or crushed red pepper, if you like. In a pan sauté the garlic and onion in olive oil. Chop the baby marrow, tomato, mushroom into small pieces, and add to pan. Chop all the veggies into large pieces. On another cutting board, chop the chicken into cubes. Place the chicken and veggies in a medium roasting dish or sheet pan. Add the olive oil, salt and pepper, italian seasoning, and paprika. Toss to combine. Bake for 15 minutes or until the veggies are charred and chicken is cooked. Enjoy with rice, pasta, or a salad. Who doesn’t love a mid-year Christmas? 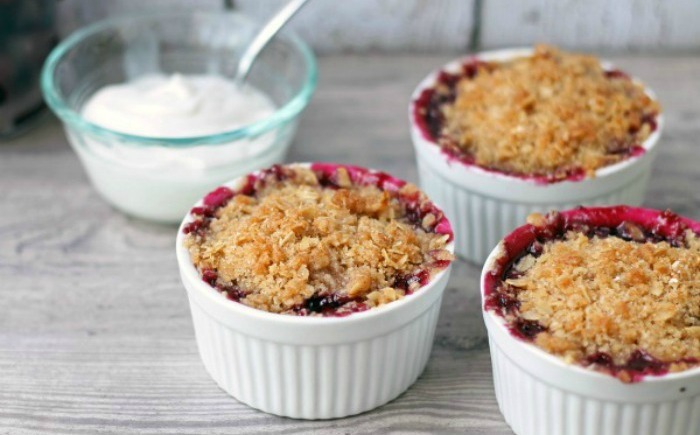 If you are feeling festive this July – give these simple but oh-so-yummy recipes a try. Place the onions, peppers, zucchini, garlic and tomatoes into a shallow roasting tray. Pour over 3 tbsp olive oil, season with sea salt and ground black pepper, then gently toss to coat. Roast the veggies for 20 minutes. Add the cherry tomatoes to the tray and lay the salmon fillets on top. Season, then drizzle with a little more oil and a generous squeeze of lemon juice. Heat oven to 190 C. Lightly spray four ramekins with baking spray or lightly butter the bottoms and sides. In a medium saucepan, combine the pitted cherries, water, honey, agave, and cornstarch. Stir to blend and put the pan over medium heat. Bring to a simmer; reduce heat and simmer, uncovered, for 10 minutes, stirring frequently. Divide cherry mixture among 4 ramekins. Combine topping ingredients and, using fingers, sprinkle evenly over each filled ramekin. Put ramekins in the preheated oven with a sheet of foil or baking sheet on the rack below to catch drips. Bake for 25 to 30 minutes, or until the topping is browned and the filling is bubbly.